A Rhodes Cover Kid competition launched in October last year with the maverick magazine title Kuier, produced an avalanche of entries, plus a new winning advert for the Rhodes brand. 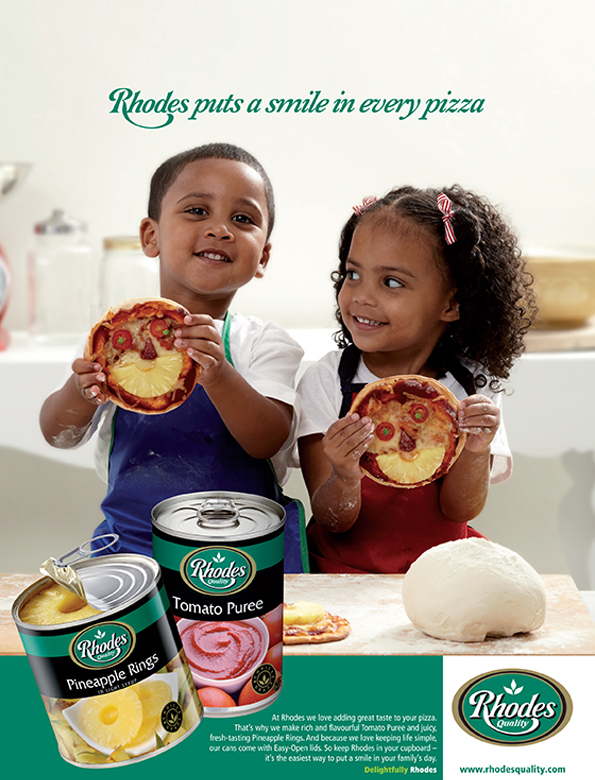 The promotion was staged to find the child with the best smile, to be used in the advertising campaign: Rhodes puts a smile in every meal. Delighted with the entries, marketing manager for Rhodes, Anneli Moolman, eventually decided to choose two winners and use them in the same advert. Three year old Tyla Smith from Atlantis and two year old Franco Snyers from Vredenburg were both naturals in front of the camera. They decorated some “smiley” pizzas with Rhodes Pineapple Rings and Rhodes Tomato Puree made for good fun, plus produced winning photographs. Franco, the perfect gentleman, and delightful Tyla each won R10 000 in cash from Rhodes. Kuier Magazine launched the competition in October 2012, and within weeks received around 500 entries. Ten finalists were chosen to appear in the 21 November edition for the magazine, with the new Rhodes advert featuring the winners, on the back page of the March Kuier edition. The successful ending to the competition coincided with the announcement that Kuier has achieved the 6th highest circulation figures of any consumer magazine in the ABC figures (Oct – Dec) released early this year. Kuier also became the top selling female title in the Media 24 stable with 94 926 copy sales twice a month. The new Fridge Friendly™ protective coating that lines all Rhodes 450 and 900g jam cans. The handy plastic Snap Cap on all 450g jam cans. Then last but not least, there are the Easy-Open lids that Rhodes first introduced to their 450g jam range back in 2011, has now been extended to most canned Rhodes products. So there you have it, three reasons to keep Rhodes in the cupboard. It’s the easiest way to put a smile in every family’s day.